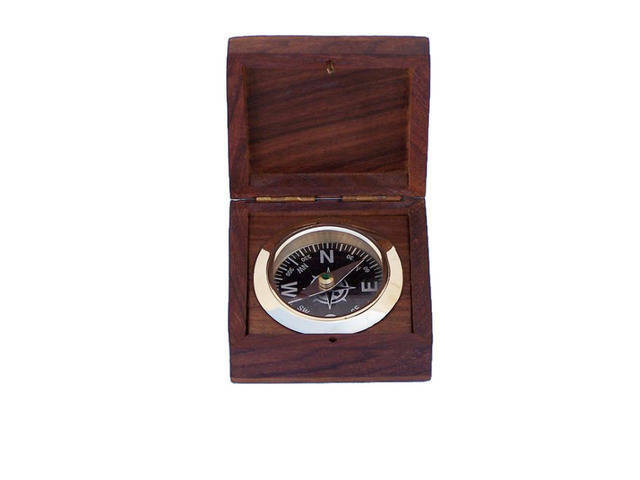 Finely crafted from solid brass, the beautiful Hampton Nautical Rosewood Desk Compass is set within a hinged box carved of solid rosewood. This compass has a clearly-marked black face which is accurate to individual degrees of bearing and the needle features jeweled movement. The Age of Discovery began in the early 15th century as European powers, especially Portugal and Spain, expanded across the globe. With the aid of a nautical compass Christopher Columbus traveled to the Caribbean, Central America, and safely through the North Atlantic on return. In his travels he improved worldly knowledge while also expanding greatly upon cultural trade and lending to the improvement of the nautical compass itself. With his travels Columbus discovered that his small brass compass varied in its readings depending on a ship’s latitude, often by a number of degrees. With this new knowledge the nautical compass evolved, as the first wet compasses were introduced in 1690. Aided by the liquid within the compass, the needle was stabilized against rapid fluctuation, making more precise readings possible. 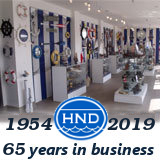 Though the first liquid compass was not patented until 1813, and marine compass manufacturers were not initially able to supply the great demand, the impact of the compass was already well documented.